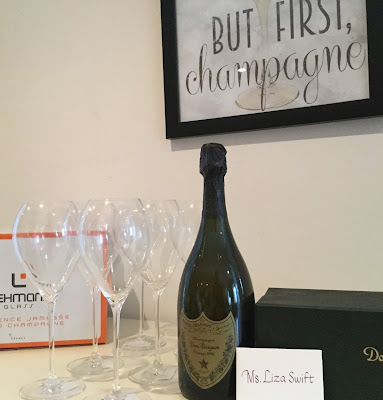 When I first heard about the theme for Wine Blogging Wednesday #77 (A Glass After a Bad Day at Work) I decided against writing a post because when I need comfort after a long, hard day I either need physical affection or food, but not wine. Bad days put me in the mood for mac n cheese, pizza, tater tots, blue cheese bacon burgers, and Haagen Dazs. And a full-body massage, of course. But since February I have had a boss from hell who has given me so many bad days, including today, that I really needed a drink. In all honesty, I needed something stronger than wine so my choice was a Single Malt Scotch: The Balvenie Madeira Cask 17 year old. Single Malt scotch refers to a scotch that comes from a single distillery in which malted barley is infused with water, fermented with yeast and distilled in a still-pot. The Balvenie is a castle and distillery in the Speyside region of Scotland that has been producing artisanally-crafted scotch since 1892. Hard to believe something so exquisite to drink comes from malted barley grain! It is a light amber colored elixir and upon sniffing (once you get past the burning of your nasal passages) this Scotch has woody, spicy (white pepper), floral(lavender) and honey aromas. Because I take my Scotch straight up it burns my palate a bit but it then mellows into honied, fruity velvet with a hint of sweetness and a lovely linger of honey, dried figs and white pepper. Ah, yes…clarity in a bottle. "Using no Malolactic fermentation and moderate oak influence, our Napa Valley Chardonnay is made in a style that focuses on the inherent qualities of this varietal. To preserve the unique Chardonnay flavors and aromas of grapes grown in this region, this wine was whole cluster pressed and cold fermented in stainless steel tanks. We aged 50% of the Chardonnay for five months in Nevers and Allier French oak barrels, selected for their tight grain that delicately restrains the oak flavors. This gives the wine a touch of oak and creamy vanilla flavors without overwhelming the natural fruit flavors". The folks at Raymond treat the wonderful fruit from Napa Valley with respect and it shows in a lovely, well integrated wine. We drank it all! I don't have any pairing notes because it was such an easy to drink wine, we paired it with a warm evening and good conversation. If you are in the St. Helena area, it is such an interesting place to visit! Whatever you are drinking, I hope you have a happy Chardonnay Day! 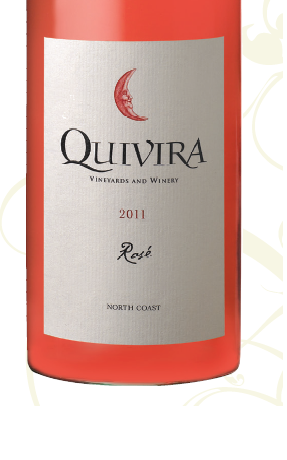 The 2011 Quivira North Coast Rosé (Mourvedre, Carignane, Counoise, Grenache, Syrah) is bright, herbal, fresh, and lush, and maybe the best vintage I’ve tasted of this wine. When I tried it at the winery several weeks back, the nose was filled with fresh mint; but this time I noticed more strawberry and basil than mint. Along with fresh strawberry, green herbs, and minerality, there’s a little brown spice in the mid palate and a soft finish. It went beautifully with the salad and leftover chicken I had for dinner last night and the straightforward salty and fatty chicken sandwich I had tonight. And with an easy drinking 13% alcohol, it’s a pretty darn good post-workout recovery drink too. 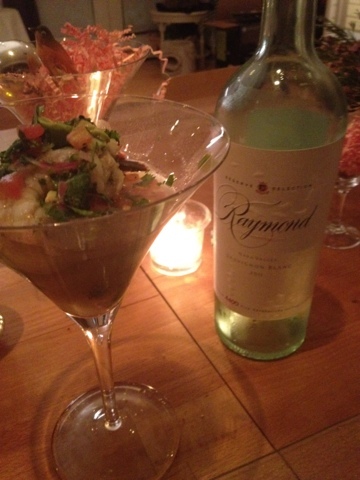 More than anything, the wine brought familiar and new comfort after a long and frustrating day. One of my dearest friends introduced me to Quivira over 20 years ago. Since then, I’ve shared Quivira’s beautiful zinfandels, Rhone-varietals, and sauvignon blancs with many friends. (I’m a member there, too). 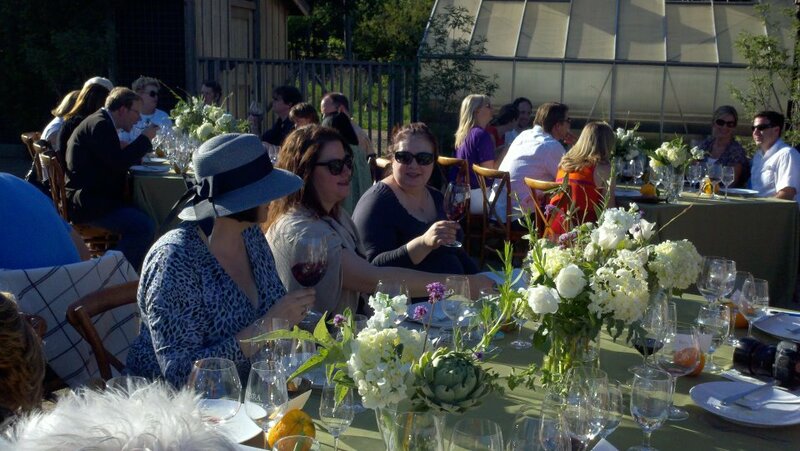 Last weekend, Brix Chicks Michele, Xandria, Liza, and I joined Quivira’s farm-to-table dinner to learn about the biodynamic farm, take in the sunny Dry Creek Valley, and feast on exceptionally prepared food from Quivira’s gardens paired with their wines. Wine that evokes sunshine, conversation, friendship is a great salve for a bad day at work. It’s even better if it has a screwcap. Quality, quantity and good QPR? My dark corporate overlords have given me LOTS to drink about in recent history, so when Wine Blogging Wednesday #77 was announced, I was already experimenting with something I had received as a sample: The 3 Liter Octavin version of "Big House Red", which takes its cheeky name from its physical proximity to the "big house" well, California Correctional Institution , in Soledad, CA. Which is near Monterey, CA a lovely place to be sent to---Monterey County, not the prison! Wine maker Georgetta Dane takes a wild assortment of varieties: 27% Petite Sirah, 14.5% Syrah, 8.6% Montepulciano, 8.2% Barbera, 6.4% Nero d’ Avola, 6.1% Tempranillo, 3.3% Malbec, 2.4% Aglianico, 2.4% Souzao, 2.3% Charbono, 2.2% Petite Verdot, 2.1% Cabernet Franc, 2% Tannat, 12.5% Other Esoteric Reds and melds them together into a comforting melange. 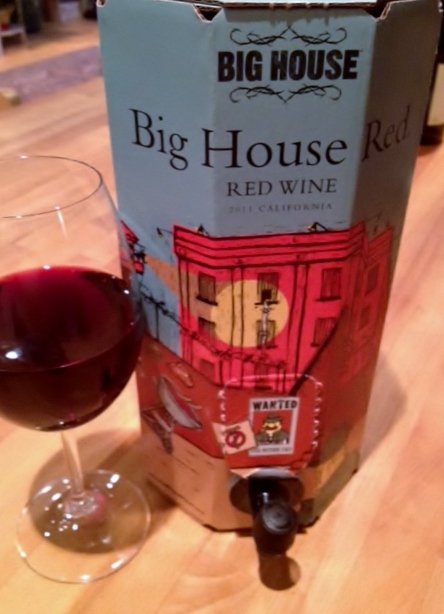 Luscious aromas of dark fruit, raspberries, hints of cigar box and vanilla. Flavors of mixed berries and satisfyingly elegant finish kissed with vanilla and spice. But best of all, Premium cask version ($22) contains the equivalent of four bottles, which is enough to wash away a month and a half of bad days .With the convenient spigot, it will even blunt some bad Monday Morning Concall Marathons with a little half glass at lunch. Go ahead, it's sitting right on the counter waiting--although the Octavin folks suggest you tuck the cask into a dark place with constant temperature. I ended up experimenting for the full 6 weeks. It was super reliable with the brightness and freshness holding on pretty well for the entire six weeks. The hardest thing for me was not drinking it all up in the first three weeks. The packaging also made it easy to alleviate not just my own workaday struggles, but all my friends who dropped by got a snootful too. Basically, the wine ships safe in its cardboard cask in a silver plastic bag with a spout. When you get it home, you position the bag in the cardboard cask, open up the spigot and you have the ability to accompany your dirge, sea chantey or happy dance with a tasty fresh glass of wine. But wait! It's not just good for erasing a bad day, its good for the environment , too. Since you eliminate the need for four glass bottles, you eliminate 85% of the waste and reduce the carbon footprint by 55%. So it's not just good or good for you, it's also good for the planet! And, Ginzu-like, there's more! Since comfort foods, like entire bottles of wine, are notoriously difficult on your waistline, having the packaging means you can easily measure out a single 5 oz/110 calorie serving so the "mean reds" don't take you from Holly Golightly to Holly Goliath. So whether you're stocking up for a pity party a pool party or a party-party, look for this to supplement your wine plan. And I hope your day is good! 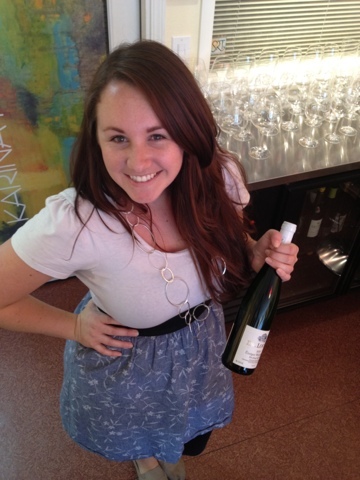 If you are in Sebastopol and have some extra time come visit Micaela at the super fun Wine Emporium. Among the things she was pouring today are the Chappellet Mountain Cuvée, a nice Arneis and BrixChick Michele's and my favorite, the Dr. 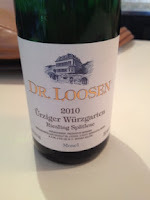 Loosen Reisling. Hailing from the Mosel region in Germany this smooth slightly sweet wine had aromas of white flowers and lychee. Flavors of citrus and lychee elderflower with white peach on the finish. Delish! We were dreaming of spicy asian food and postulating the many snacks this would pair well with when we realized we were late for our "Golden Girl" linner! I can't believe it's that time of year again, but I am so glad I am going! You should too, if you can make plans to attend. Vinify Winery is the custom crush facility where a lot of the boutique producers who serve at Vinoteca create their magic elixirs. WHY: 15+ Producers, 10+ Varietals, 50+ Wines. Get to taste some amazing wines and the chance to meet, greet and discuss the wines with the people who make them. It's always a great event, rain or shine, heat or cold and BONUS: At this event you can buy all the wines being showcased. Carry out and shipping will be available. Frostwatch will be there. Hopefully with their delicious Semillon Sauvignon Blanc blend, Kismet. As always, a generous spread of cheeses and other tasty wine treats will be provided. Tickets purchased online May 2-May 6th or At The Door will be priced at $30 each, no processing fees. You do not need a Pay Pal Account to purchase tickets online. To register, click on the Register Now button below.